The nine-hole 1,399 yard Holiday Inn Golf Course in prosperous Point Edward is not your average executive layout. Yachts in the adjacent marina line the fairways of this heavily treed par 3. The beautiful location is not the only reason for its place in history; it was an eager eight year-old Mike Weir who played his first rounds on this cozy Robbie Robinson creation. The Holiday Inn has been part of the area since 1971 and the golf course opened a year later. It is operated by Gord and Michele Nimmo. 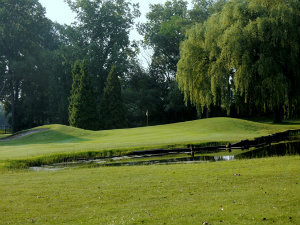 They describe it as friendly course that has changed little over the years. Only the trees are taller since Mike played here in the late 70's. The golf course is an ideal place for beginners, seniors and families as well as anyone who wishes to sharpen their short game. It appears easy but can be a challenge.